인칭대명사 (personal pronoun) 어떻게 쓰나요? 인칭대명사 (personal pronouns) 에 대해서 잘 알고 계신가요? 혹시 알고는 있지만 어떻게 사용하는지 자신이 없으신가요? 오늘은 각 인칭대명사의 차이점과 어떻게 사용할 지에 대해서 정리해 보겠습니다. 인칭대명사는 사람을 가리킬때 대신 쓸 수 있는 말로 영어에서는 굉장히 많이 사용됩니다. 이름을 계속 부른다면 대화시 조금은 불편하겠죠. 이런 인칭대명사에는 1인칭, 2인칭, 그리고 3인칭이 있습니다. 1인칭(first person)은 말을 하고 있는 사람이 본인을 가리킬때 씁니다. 2인칭(second person)은 대화를 함께 나누고 있는 상대방을 가리킬때 씁니다. You are very excited about your trip. 3인칭(third person)은 대화에 주제가 되는 다른 사람들을 가리킬때 씁니다. He is going to see a film this afternoon. 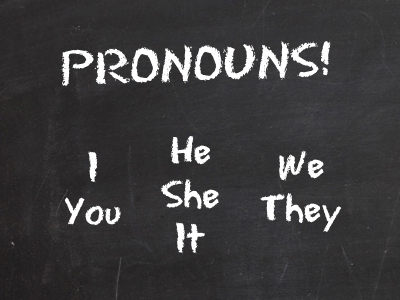 주격 대명사(subject pronouns), 목적격 대명서(object pronouns) 그리고 소유격 대명사( possessive pronouns)입니다. 주격 대명사는 문장의 주어에 쓰이는 대명사로 사진에서 확인할 수 있습니다. 주격 대명사는 언제 사용할 수 있을까요? We are going on vacation tomorrow. 목적격 대명사는 동사 다음의 목적어 자리 또는 전치사 다음의 목적어 자리에서 사용되는 대명사 입니다. Pass the book to me. My son is named after you. Rob bought him a present. There are five of us coming to dinner. I will collect them from the airport. 소유격 대명사는 누가 또는 무엇을 소유하고 있다고 말하고 싶을때 쓸 수 있어요. His favorite subject at school is English. Her car is parked outside. The puppy dumped its water bowl. Our favorite city is New York. Their house is a five-minute walk away. 밑의 문장을 한번 채워보며 복습해볼까요? Ian and Rosa have been travelling for a year. ______ come home next week. Rob loves Italian food, ______ favorite dish is pizza. Thanks for the flowers, I will put _________ in a vase. Lucy’s birthday is next week. ______will be turning 25. The dog is chewing ___________ bone. The Arctic Monkeys are my favorite band. I love __________ music. 댓글로 정답 또는 더 궁금하신 사항이 있으면 남겨주세요.